The 15th annual Roar By The Shore Rally is coming up next week… so if you are on your way to Biketoberfest (October 16-19), why not head out a bit early and make a stop in Texas. Head down to South Padre Island and make your trip a real vacation. If the locations sounds familiar, it could be from some hazy, distant memory of a long past spring break… or maybe you have just heard of it before. The expected 25,000 bikers will arrive for the duration of October 9-12th. During this time, there will be loads of fun to have including a fully escorted ride to Nuevo Progresso, Mexico. The Mexico Fiesta Run is not to be missed. You will be met by a group of escorted Mexican bikers who will mingle with you on the Main Streets as bands play, food vendors satisfy your culinary cravings, and shopping is had by all. 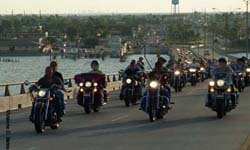 If a ride into Mexico isn’t your cup of tea (or bottle of beer), than take advantage of the Iron Horse Memorial Parade, the Casino Night, Tattoo Contest, and/or the Costal Current Poker Run. One thing is sure, there will plenty to keep you occupied for the long weekend. Drop us a note and let us know what you think! This entry was posted on October 4, 2008 at 8:40 PM and is filed under Motorcycle Rally, Motorcycle Tour and Travel, Uncategorized with tags Motorcycle Rally, roar by the shore rally, texas. You can follow any responses to this entry through the RSS 2.0 feed. You can leave a response, or trackback from your own site.